A little over month ago, I found myself traveling to rural Anhui province. Coal+Ice, the documentary photography exhibition I had produced for Asia Society, had been invited to exhibit at the Yixian International Photography Festival. Logistically, this exhibit proved a daunting feat. 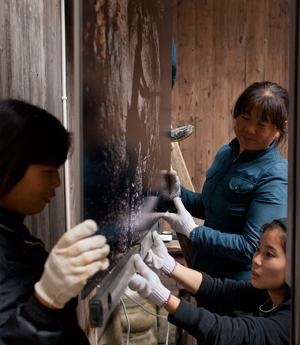 Fifteen massive crates of photographs were driven all day from Beijing to Pingshan Village, where the power of ten men would carry each crate 500 meters down a rocky hill to the exhibition space, an ancestral hall that dates to the late Ming dynasty. I calculated our exhibition’s wattage needs and we borrowed electricity from the farm next door. Five villagers became our art handlers. We had only one week to install. On the day before the opening, we still had about two more hours of installation ahead of us when we discovered the festival had been “postponed” by the county government. This story originally appeared on Asia Blog partner site ChinaFile, a new online magazine from Asia Society's Center on U.S.-China Relations. It might have just been another case of a creative endeavor fallen prey to the Chinese government’s paranoia ahead of the 18th Party Congress. But instead, after sitting around the ancestral hall for about half an hour, looking sullen and frustrated, our team stood up and finished installing the show, even though we knew few people — if any — would ever see it. Yixian’s Festival was a small part of a larger effort by intellectuals and artists who have turned their attention and energies to “developing” the countryside even as China continues to urbanize. Rural reconstruction, as their movement is called, encompasses a series of efforts over the past century or so to revitalize the countryside through educational, economic, and cultural reform. The current experiments taking place in southern Anhui province are especially interesting because of the history of the region and the artistic background of the current participants. Pingshan Village is situated in the historic Huizhou region of southeastern China. During the Ming dynasty, merchants brought great wealth to Huizhou. Youth from the area were encouraged to leave the region to apprentice and return with new skills. Craftsmanship and architecture flourished in this period, and the remnants of ancestral halls are seen throughout the region. Today, Yixian oversees a portion of this once-flourishing region that includes Pingshan Village and six other villages scheduled to participate in the Yixian International Photo Festival. In 2011, Ou Ning and Zuo Jing, two creative entrepreneurs, made Yixian their second home. Ou edits Chutzpah, a bilingual literary magazine based in Beijing. He also makes documentary films and curates major contemporary art shows. This year, he curated Yixian’s Photo Festival. Zuo is also a curator, an artist, and the editor of two magazines, Han Pin and Bishan, focused on Chinese traditional culture. Together, they founded the Bishan Harvestival, a cultural festival in Yixian’s Bishan Village. In Bishan, Ou and Zuo are attempting to bridge the increasingly large divide between countryside and urban life; the Harvestival celebrates this effort. This year, the Photo Festival was to have coincided with the second Harvestival. When Ou invited Coal+Ice to come to Yixian, we immediately accepted. This would be my seventh trip to China, but my first beyond its cities. Having grown up in semi-rural California and now living in New York City, I have long been interested in the relationship between countryside and city in the United States. I worry about what happens to communities when their most valuable export is their ambitious and educated children. Coal+Ice depicts the relationship between coal mining and climate change through photographs by 30 photographers from around the world, many from China. Given that rural regions often pay a more immediate price for our reliance on fossil fuels than urban areas do, I was eager to see how a rural audience would receive this project. And that is how I found myself traveling to the Anhui countryside this past November with my colleague Sun Yunfan and Coal+Ice exhibition designer Jeroen de Vries. While in Anhui, we stayed at Bishan’s Zhulan Er Ba, or Pig’s Inn #2, a renovated Qing dynasty merchant’s home. The house has been converted into a ten-room inn catering to visiting Chinese artists and intellectuals, as well as foreigners. While there, other guests included two French families and a Dutch diplomat with his parents. The proprietor, Han Yu, also served as the lead designer in charge of the building’s restoration. After many years in Shanghai, she moved with her husband to Yixian eight years ago, starting her first venture — the original Pig’s Inn — in nearby Xidi. Aside from Han, her husband, and Ou, the rest of Bishan’s occupants are mostly people whose families have lived there for hundreds of years. The more successful villagers have moved to the county seat, a few miles away. Many homes in Bishan lie vacant. Open courtyards throughout Pig’s Inn #2 allow sunlight, birds, and rain equal opportunity for access into the building. The foreign sounds of ducks squabbling outside my window would wake me in plenty of time for our daily drive to Pingshan Village, where we would install our photography exhibition. Every day, Pan Min, a young van driver from Xidi Village, brought us to and from the inn, skillfully maneuvering at breakneck speed through tight alleyways designed centuries before the automobile and still free of traffic lights, stopping to pick up our volunteers, two journalism graduate students from Anhui University. As in Bishan, many of Pingshan’s villagers look for work elsewhere, but the village is also organizing to bring money in through tourism in a way Bishan is not. A government-owned tourism company is constructing a new ticket booth at the edge of the Pingshan to collect village entry fees. The nearby villages of Xidi and Hongcun, designated as heritage sites by UNESCO in 2000, already require paid entry and have a virtual monopoly on mass tourism. Pan, our driver, has clearly done well by tourism. But the UNESCO villages are now overrun with tour buses and parking lots, and not all of their residents have benefited equally. An ancestral hall had recently been torn down to build a roller skating rink in Pingshan, and issues of preservation and development were on people’s minds in the village. While we were there, the restaurant where we ate lunch each day, The Gentlemen’s Residence, built a new entryway with a signature Huizhou-style roof, with black tiles and upturned eaves. Jeroen, the designer, was dismayed by what he termed this “copy-clone” trend. It was hard to tell old from new in Pingshan. Because Pingshan cannot compete with Xidi and Hongcun for tourists, the village hosts groups of university students who practice painting the region’s distinctive rooftops and mountainous skyline. The manager of the local tourism company told us they planned to redistribute ten percent of the proceeds to the villagers at the end of the year. While this will bring in a small amount of income, the students also create piles of trash the village is not yet prepared to handle. Bishan is the only village in the county not planning to sell tickets for entrance, which is one of the main reasons Ou Ning chose it as the home base of his movement. Because of Bishan’s natural beauty and more “off-the-beaten-track” feel, one could easily imagine it becoming a community of second homes for wealthy urbanites, not unlike an Italian hill town. But Ou seems to have loftier goals. During our first week, except for some grumbling among Festival participants about photographs deemed “sensitive” by the local county government, Beijing and the coming 18th Party Congress felt very far away. The ancestral hall in Pingshan where we installed our exhibition was built to honor ancestors of the Shu family, and four of the five villagers working with us had the family name Shu. Jeroen remarked that the five villagers-turned-art handlers were better than many trained art handlers he had worked with around the world. After our daily lunches together at the Gentlemen's Residence, they would collect our leftovers and go home to feed their pigs. Many of them were farmers for part of the year, but the elder of the two Mr. Shus was in the process of cutting back on farming. He told Yunfan and me that farming was no longer profitable enough to be worth the heavy labor it required. Instead, he is now more reliant on odd jobs in Yixian town. Earlier this year, he had learned of his mother’s death while he was outside the village on a job. Because so many people in Pingshan now work outside the village, it was hard for Mr. Shu to find enough people to perform the traditional funeral rites for her. Instead of eight to ten people carrying the casket, there had to be only four. He could not find enough musicians to form a band. His sadness as he shared this story with us was palpable. It’s easy at such moments to feel nostalgic for traditional village life. But then I look at our driver Pan Min, who is clearly thankful for the economic opportunity the tourism in Xidi has brought him. He talks about moving to Shanghai, and surely does not want to farm any more than I want to go homesteading in California. But as the weeks went by, I learned more about how proponents of the shifting movement that carries the name “rural reconstruction” view these issues. All of them are romantics to varying degrees. The refined Pig’s Inn certainly makes village life attractive for its guests. But I now think about what Ou Ning is trying to do in terms of Mr. Shu. Rural reconstruction attempts to make life in the village sustainable for locals like Mr. Shu. Toward the end of the week, a string of LED lights was turned on in Bishan. Taiwanese architect Teng Hai, from Open Union Studio, designed the installation and organized its electrical needs by securing the villagers’ permission to plug the lights into their home outlets along the way, illuminating alleyways previously lit only by the moon. By the time the festival was officially canceled, participants had arrived or were already on their way. The night of the cancellation, Orville and Baifang Schell arrived from Beijing. We had dinner with Ou, a few participating photographers, and Tawainese folk musicians and environmental and social activists Lin Sheng-xiang and Zhong Yong-feng. Lin sang “Happy Birthday” to me in Hakka dialect. (Yes, the festival was canceled on my birthday.) Everyone, of course, wanted to hear the postmortem from Ou, but talk quickly turned to what we could do in spite of being shut down. Pig’s Inn #3, set to open next year, is located slightly outside the center of Bishan. It is surrounded by beautiful farmland and sits beneath mountains that are green or purple, depending on the time of day. A pristine stream flows beside it. This would become one of the two main venues for the makeshift festival, along with Ou’s home, in Bishan. Abigail Washburn, a Mandarin-speaking banjo player from Nashville, Tennessee, was scheduled to come perform American coal mining music at the Coal+Ice exhibition. She learned the festival had been canceled while still in the U.S., but decided to come anyway. On “opening night,” after a dinner for more than 100 people, the Taiwanese musicians performed at Pig’s Inn. During their performance, Abigail’s car arrived, and fresh off 20 hours on the plane from Nashville and five hours in the car from Shanghai, she performed in English and Mandarin to an enthusiastic audience of volunteers, artists, and organizers. The next evening, back at the Pig’s Inn, we gathered, fittingly, for a pig roast and then enjoyed performances by a Kunqu opera troupe from Jiangsu province and Wu Tiao Ren, a Guangzhou-based duo who play guitar and accordion and sing in their local Haifeng dialect. The following day we arrived at Pingshan to discover the front doors of our exhibition had been locked and barricaded from the inside, but we were able to get some small groups in through a side entrance. Abigail played her coal mining songs in the hall for a small audience; the set ended in a kazoo performance by Abigail and Wu Tiao Ren of “Down in the Coal Mines” in English and Mandarin. The audience joined in with a few extra kazoos and marched around the exhibition hall. Every day, renegade gatherings continued to occur. Originally a whole series of films on American agriculture had been planned, but we were still able to see Sweetgrass by Ilisa Barbash, who was in Bishan. The film follows cowboys in their last season herding sheep through the mountains of Montana. At one point in the film, cowboys find arrows made by Native Americans. It was interesting to discuss with a Chinese audience how the dying cowboy tradition had replaced an earlier tradition not all that long ago. Huang Sheng-yuan, an architect and founder of Field Office who hails from Yilan County in Taiwan, discussed his efforts over the past ten years to encourage university architecture graduates from Yilan to return home after graduating. His presentation prompted the audience of Harvestival volunteers and participants to look past short-term pitfalls in rural reconstruction efforts, such as the cancelation they had just experienced, and reminded everyone in attendance that his presentation of successful projects could only occur because he and his team have carried on for many years, despite numerous temporary setbacks. As we were leaving Bishan, we ran into Teng Hai and his colleague Liu Kuo-Chang, who were house-hunting in the village, hoping to renovate a merchant home and offer some friendly competition to Han Yu’s Pig’s Inn empire. But the real competition comes in the form of an unnamed property developer who has recently purchased a large swath of the farmland between Bishan Village proper and Pig’s Inn #3 from the government. But this same local government, we have learned since returning, has offered the Xian Feng bookstore from Nanjing a 50-year lease to open the first bookstore in Bishan. Leah Thompson is Assistant Director of Asia Society’s Center on US-China Relations. She is a video editor and the Associate Producer of COAL+ICE, a documentary photography exhibition.